For an amazing $3.96/month, you can start taking advantage of HostGator’s unlimited plan, giving you unlimited disk space and bandwidth. 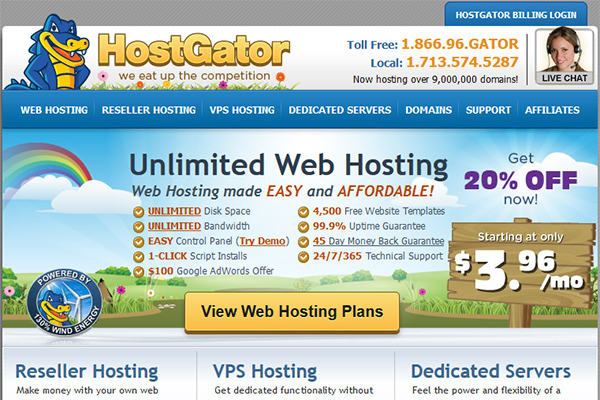 With free site building tools and templates to work from, HostGator could have your website up and running in no time. HostGator also gives you a free domain name, which means you could build the website you’d always wanted. If you ever hit a snag with HostGator, you’ll have access to award-winning technical support 24/7/365 by phone, email and chat. Throw in a huge number of supported software aps, and your dream site is now in reach with Host Gator. In fact, with a 45-day money-back guarantee, it seems hard to match the great blend of power and price provided by Host Gator. Many hosting companies are easy to use, but few offer the instant/free setup feature that HostGator does, which promises to have you online in 15 minutes or less. Once you’ve got some space on the web, HostGator also makes it incredibly easy to build your page the way you want. You can use either an up-to-date cPanel, or website builders from Soholaunch and Weebly, which will give you simple access to drag-and-drop building. Setting up email accounts can be just as easy as site building, since all you’ll have to do is choose an address and password to start receiving and sending emails on behalf of your domain. With an unlimited hosting plan, you’ll never have to worry about your traffic or storage, meaning you’re encouraged to build a site as big and successful as you can. With easy to use website building features, you’ll be able to put your site online in a flash. But, of course, if you’d rather use the famous content management features offered by WordPress, HostGator still has your back. For people with more proficiency in webhosting functions, HostGator’s well-organized cPanel may be the way to go. With all of the tools you’re looking for at your fingertips, HostGator certainly makes a complicated process seem simple. Fully supporting popular coding languages, like Perl, Python, PHP 5 and Ruby on Rails, you’ll be able to build your whole site from square one. If you’re trying to establish an eCommerce presence with your website, you’ll find lots of support from HostGator. HostGator offers you a choice between 3 of the most popular shopping carts around these days: osCommerce, ZenCart or Cube Cart. For your customers’ security, you’ll also receive a shared SSL, which basically encrypts your customers’ information so that it doesn’t fall into the wrong hands. To help attract customers, HostGator gives you a $100 Google AdWords credit, which allows you to advertise your page on the most popular website in the world—making it a great way to get noticed. With 24/7 customer support by phone, chat or email, you’ll be covered no matter what happens with your HostGator plan. HostGator’s customer service representatives seem to know everything about their company’s service, making them very helpful and courteous. If you’re more of a visual learner, you’ll find a wide array of video tutorials to walk you through common webhosting procedures. Or you can find help on HostGator’s forums, connecting you with a world of users just like yourself. With an introductory rate of $3.96/month, HostGator’s Hatchling plan allows you to lock in one of the best rates in the industry for a 3 year term. The Hatchling plan gives you unlimited space and bandwidth, making it a totally viable option for most users. If you want to host multiple domains, however, you’ll want to upgrade to either the Baby or Business plan, which cost $6.36/month and $10.36/month respectively. All of these plans are backed by HostGator’s 45-day money-back guarantee, minimizing your risk. HostGator gives you great hosting with a great introductory rate, practically giving away unlimited bandwidth and storage compared to what some other companies are charging. Newcomers will benefit from simplistic tools, while savvy web veterans will adore HostGator’s intuitive cPanel and awesome script support. Either way, you’ll be able to design your site with confidence, knowing that HostGator’s award-winning customer service representatives are there whenever you need help. Throw in $100 in Google AdWords credits, and you’ve got quite a powerful and enticing package to help you build the website that you’ve always dreamed about.